We sell a ton of these machines to beauty shops and barber shops Completely remanufactured looks like a new machine. Works like a new machine. We take remanufacturing seriously. Small location. Dixie Narco 276 Drink machine The Dixie Narco 276 Drink machine is a beauty to behold. 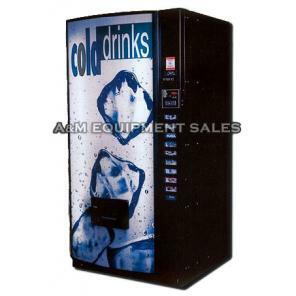 Available for a mere price of $1195, Dixie Narco 276 Drink machine is as good as any of the newly built models. When it comes to used machines, our refurbishing policies are very clear. We never let a vending machine go through us without a complete and thorough check. All the parts that require mending are firstly worked upon. Only when working together & well, the entire machine is sent to be painted, as good as the new. Dixie Narco 276 Drink has a capacity of about 250 cans and due to its slim and sleek design doesn’t require too much of space to fit in. Dimensions: 72H x 28W x 28D. Six selections – Canned Drinks 12oz..
Dimensions 28″ W X 28″ D X 72″ H.
Warranty – 90 days parts. Shipping not included. New lexan waterfall sign, paint, new lock and keys, your choice of flavor strips, set prices and make sure every part of the outside of the machine has a new looking appearance. Remanufactured by: A&M Equipment Sales Since 1964.